Join the discussion on our forums! 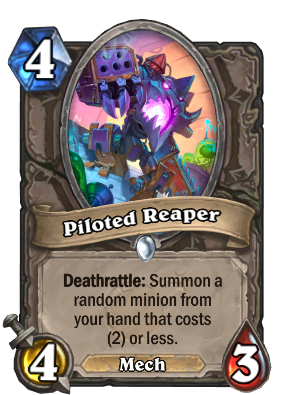 Come discuss Piloted Reaper over in our dedicated Piloted Reaper discussion topic. So it's Piloted Shredder except you can sort of control what pops out after it dies. No more Doomsayers! Would this work with cost reduction (eg Dreampetal Florist, Corpse Widow, etc)? Will not be even a fraction as omnipresent as Piloted Shredder was back in the days since it uses up a card from your hand instead of pulling one from thin air. Controlling which card pops out is nice but it's not going to be viable to run Millhouse Manastorm just to feed this card. Maybe it goes in a non-Keleseth version of Zoolock, since it would be good to pull Vulgar Homunculus or Void Analyst. Even Paladin has a new reason to live. "Prepare to face the mighty Millhouse Manastorm!" I don't understand people. This is basically Piloted Shredder, but better becouse you can choose minions you want to see in this. And Shredder was the cancerous thing of all GvG-in-meta times. So why people vote for good and not Meta-Defining? I dont understand. This new one is good, but not good as the old Shredder: it doesn't worth a slot in control decks(unless you want to throw away your doomsayer), you need to build your deck around it, and most of this meta's aggro decks are Odd. Unlike Piloted Shredder, you can control what this is going to summon and it's limited to things that you included in your deck (most likely). Great for Arena as well. A nice 4 drop, for sure. This card is terrible. Not only do you need to line up a two drop, which is unlikely and impractical on Turn 4, you are only saving two mana. A 4/3 stat line is a underpowered for a 4 drop, so in reality you’re only saving 1 mana. It’s so specific and so minor, it’s just terrible. There are enough 2 mana deathrattles that Quest Priest wants to run that Piloted Reaper could easily find a home in that deck. If they didn't give a nod to Piloted Shredder I was gonna be a little upset. I can only see this a few times where warrior discovers it and uses it to pull Eternium Rover or something. Not half bad, but not your best magnetic target and with so little things in the mech department to pull, I don't see it. Thas card could fit in an even Shamen. 1. You have a lot of top tier 2 drops in your deck. 2. Upgradeable Framebot is good with Flametongue Totem and Dire Wolf Alpha, and maybe this opens up a little mech package you could fit into your deck. He's back! Run away, fools! This is basically what Piloted Shredder should've been. This does provide mana-cheating and it is very good. Piloted Shredder is way better because it gave you a two drop for free. This card pulls it from your hand which is not always possible, and denies you card advantage. It’s bad. Way worse than Shredder.